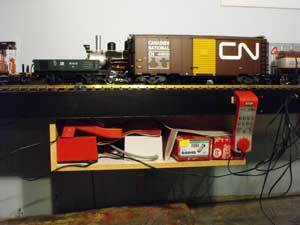 G-scale Model Railroads Can Be Built Indoors, Too. In my previous home my indoor G scale model railway was attached to the walls 68" above the floor. That put the track at my eye level. The Utopia Northern HO and HON3 layout was beneath it, usually with clearance of 24" around the walls. The HO layout base level was at 38" and rose to 48" in the center peninsula. There were spots where the large scale track was only a few inches above the scenery. The large scale trains ran on a double-track mainline above the HO layout. Here the scenery rose close to the G scale layout. I kept the controls simple. The automatic turnout controls were never installed. I installed a hanging shelf for the basic controls. Good news. We found a new home. There's a good-sized backyard that will be ideal for a garden railroad. This winter while the snow blows I can do research and make a trackplan. I am leaning towards constructing the layout with Trex or HDPE (high density polyethelene) instead of trenching and using weather-resistant lumber. I found some interesting articles on the internet about this technique but need to delve into the subject further. Several of the engines are DCC equipped, some aren't. On the indoors layout I usually ran a DCC train by engine number in one direction and a non-DCC train on position 0 in the opposite direction. I need to look into converting the engines to battery power to avoid outdoor wiring of the track. On my basement layout there were some passing tracks and a semi-John Allen type switching puzzle incorporated into the trackplan. I have enough turnouts to do a small yard and some passing tracks in the backyard. The layout will probably be a dogbone with one end under the deck off the kitchen and the other loop beside an existing garden shed. The mainline will roughly follow the fence line down one side and the back of the yard. There are no substantial gardens in place so the landscaping is an open canvas (with my wife's permission). I only have about a dozen cars and a few engines including the two that came in the LGB starter pack. 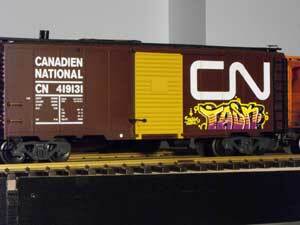 One of my former co-workers was a graffiti artist of some note and painted one of my boxcars with his nom-de-plume "Task". There are decal sheets of graffiti available from Microscale that I've used on some HO cars but there is nothing like having a personalized boxcar in large scale. Click here for some real graffiti photographed on the Canadian Pacific mainline near Alliston, Ontario in 2007. You don't see many articles about indoor garden railways. Most are outdoors and are well covered in Garden Railways magazine. There was a series from August to November, 2005 in Model Railroader magazine that detailed how to build an indoor layout. If G-scale excites you, check out that project railroad. There's a lot you can do even in a relatively small space. If you'd like to see pictures of a spectacular Canadian outdoor garden railroad, click here for Brain Swanton's G-scale garden railroad representing the historic Kettle Valley Railway of British Columbia, Canada. There are also some excellent G-scale layouts in the Muskoka Tour video. For G scale trains running on a 40 X 60 foot indoor layout, have a look at the video I made of the Hockley Valley Railroad in Alliston, Ontario. An interesting source for structures and structure plans for G scale is the doll house and miniatures hobby. If you like scratchbuilding you can also scale up structure plans from Model Railroader in addition to Garden Railways magazine or other railroad-oriented magazines or internet sites. In the February, 2013 NMRA magazine, Kadee advertised remote couplers that open and close with a push of a button. They are designed for G scale and #1 scale. Go to www.remoteuncoupling.com for more information. I dismantled the indoor layout in October, 2014, in preparation for our move to a new home. Now we're in our new home with a large backyard so I will have the opportunity to build an outdoor garden railway. Go from "G-scale" to my Outdoor Garden Railway Construction. Return from "G-scale" to my Home Page.